The perennial sow thistle (Sonchus arvensis) is often confused with the annual sow thistle (Sonchus oleraceus). 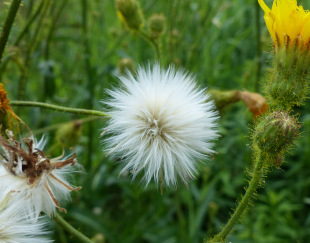 The main difference between the two is that the annual sow thistle has much smaller flowers (less than 2.5 cm across) than the perennial sow thistle. 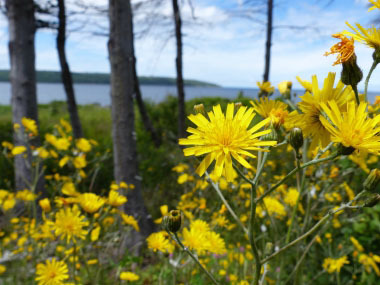 Perennial sow thistle flowers are larger and resemble the dandelion. Both plants are edible. Annual sow thistle tends to be less prickly. 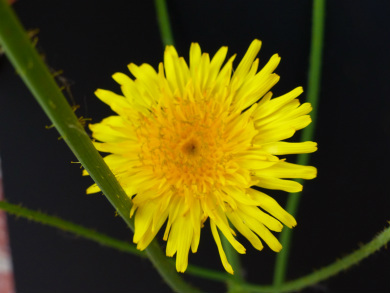 Distinguishing Features: Many people tend to confuse sow thistle with dandelions. 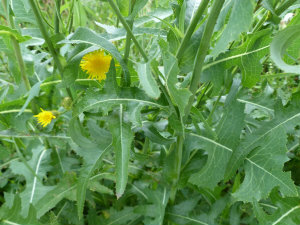 Sow thistle usually has many flowers sprouting out on each stalk. Dandelion only has one flower per stalk. 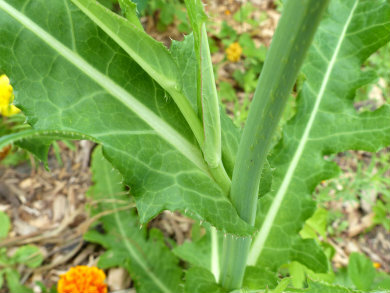 Sow thistle leaves grow all the way up the stalk, as well as at the base of the plant. Dandelion leaves are only at the base. 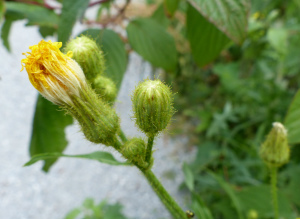 Sow thistle stems are unbranched until towards the top where it braches out and flowers develop. Flowers: Flowers are produces in loosely branched, elongated, erect clusters. Each flower is yellow and has a lance-shaped bract on the outside. The flowers are hermaphrodite. Fields of Nutrition has medicinal benefits and vitamin/mineral content of Sow Thistle. Leaves: The leaves are alternate, simple, and are the broadest near or above the middle. Leaves can grow between 10 and 35 cm long and are between 4 and 14 cm wide. They are deeply lobed along the margin and the spiny toothed, lobed leaf bases clasp the stem. Height: The sow thistle can grow up to 1 metre high (just over 3`). The stem is upright and produces a milky sap. Habitat: This plant will grow almost everywhere. It likes cracks in driveways, roadsides, fields, meadows, and gravel banks. 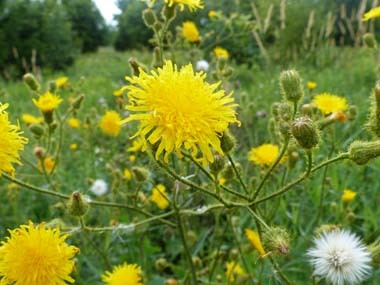 The sow thistle was introduced to North America from Europe. Edible parts: The leaves, flowers and roots are edible. These are best consumed when the plant is young because the older it gets the more bitter it becomes. Once it becomes bitter you can cook with it or mix it with pleasant tasting greens. Leaf spines need to be removed. The leaves are rich in mineral salts and vitamin C. Harvesting the root while young is preferred and can be roasted and grounded to use like coffee.